Our reputation in the market grows by offering the best array of Xmas Hanging Balls that are designed by our vendors. They are available in many sizes. This is a x-mas decorative ball, it has further uses also. like fancy bag tags, nd many party decoration uses. this ball totally hand made. Sizes Available: 5" long with a 2" hanger. Made from exclusive paper masche with the combination of two colors Golden background and design with white. Our collection of Christmas Decoration items includes a variety of handmade products. Crafted solely from quality metal, each art piece of the collection is not only striking but also durable. 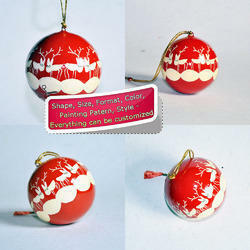 Papier Mache balls are available for Christmas/customer preffrence purpose. Available with 2" & 3" size with assorted designs. We are the leading manufacturer and exporter of Christmas Ball Hanging. 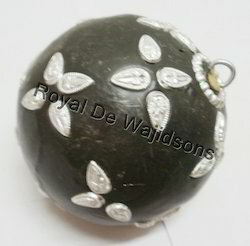 The Christmas ball is manufactured using hand made metal of high grade quality with supreme finish. The mesmerizing design and attractive colors makes our products most sought in the market.